Once stored in a black-page scrapbook, this seventy year old photograph captures my father’s smile, ever gentle and warm. Norman appears tickled by his pup’s misbehavior. Or perhaps the teenager is amused by his dad’s struggle to hold the wiggling black and sable shepherd. Even George Strickland seems to be stifling a smile as he hugs the dog, cigarette at the ready. 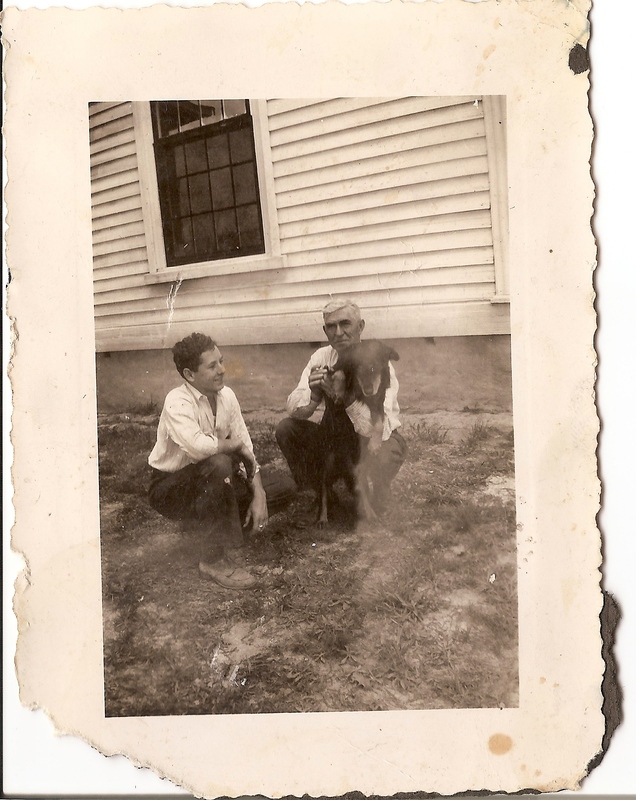 This father-son moment was snapped by a mystery photographer in front of their home, the Dodson homeplace built by Norman’s great-grandpa, James, in 1859. The farm was located just off the Boydton Road, a few miles south of Chase City, Mecklenburg County, Virginia. they used to attend in Chase City too, don’t you think? Sad that the house is no longer. Our relationship with our doggies acts like a magnifying mirror of who we are, at our best and worst. They somehow free us to be astoundingly affectionate, extremely emotional, hyper-playful, and sadly to release a rage we would never vent to friends and family.